When you're out sight fishing to big Trout and Redfish, you need a set of flies that can handle any situation. Sometimes the bite is on and game fish will aggressively smack anything that’s thrown in front of them. Those are the good days. But as every angler knows, there are days where the fish are picky and are only keying in on one food source. These are the times when having an arsenal of flies that resembles all the prevalent bait fish in your particular location is a must. This article will cover the flies that every fisherman should have in their box and the ones that work best when sight fishing to Redfish and Speckled Trout in the Gulf Coast region. Almost every saltwater fly shop has a variation of the traditional Kwan fly, or sometimes referred to as the Redfish Toad. Much like other flies designed for the flats, it lands soft and quiet, sinks slow, and when tied with a weed guard can be used in the skinniest of water. Traditionally it is tied with a Craft Fur tail, a little flash, a small attractor/egg hot spot, a palmered hackle collar, segmented sections of yarn or EP fibers, and some bead-chain or lead eyes. The basic shape of the fly tends to replicate many sources of the Redfish’s diet, such as shrimp and crabs, and can be tied in countless color variations to suit all water clarities. The Texas Toad, pictured above, is a good example of one such variation. When you want a good all-around fly that will catch any game fish you can see, tie on one of the most well-known saltwater flies, the Kwan fly. The Redfish Crack fly is a proven and very successful fly increasing in popularity in the Texas and Louisiana fisheries. It has a large head that pushes water and the head to tail contrast makes it highly visible and attractive to fish. When retrieved with quick short strips it closely resembles a fleeing shrimp and the head pulses with bite-enticing movement. While it was initially intended to target Redfish, it does equally as well for large Speckled Trout up on the flats. 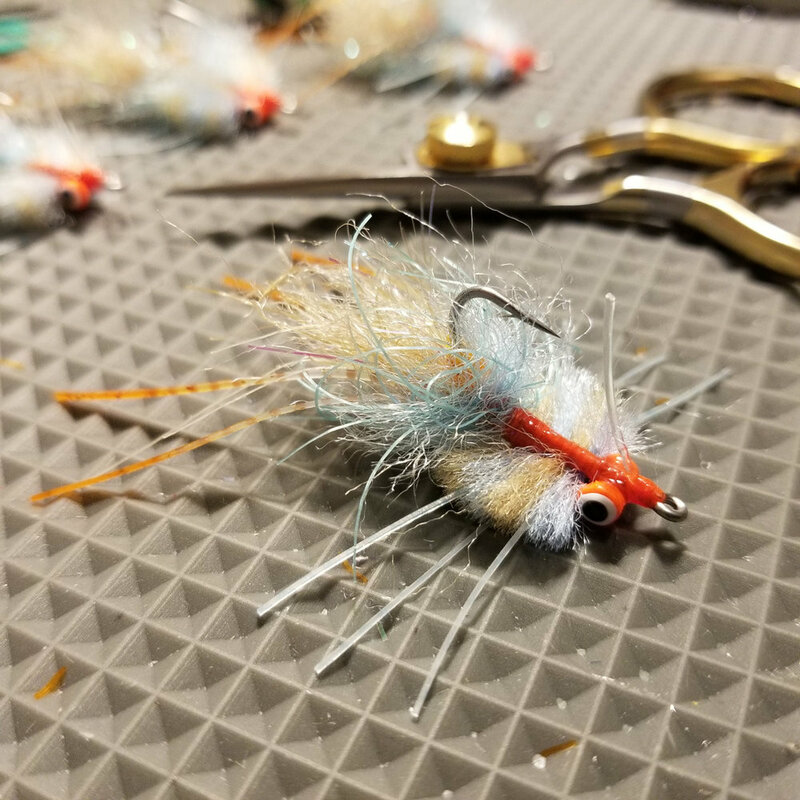 The original pattern was tied with a tan Craft Fur tail, an orange/red Catcus Chenille body, and an olive streamer brush head; but, this fly is highly versatile and can be tied in many different colors, materials, and eyes. One variation of this pattern is the Redfish Cracklin, it adds in tons of movement with legs in the tail and a super buggy brush head. Gurgler flies are the top waters of saltwater fly fishing. Floating on the surface, they pop, splash, and create noise when being stripped. They are superb at grabbing the attention of fish from a distance, in murky water, or when the visibility is low. Most gurglers are built with a foam body with an aggressive front head and have a marabou, buck tail, or craft fur tail. The colors can be mixed and matched in an endless array, but here on the Texas Coast a blend of natural browns with orange flare seems to be a winning combination. Short, quick, aggressive stripping will have the fly gurgling through the water and will trigger a natural reflex that makes fish want to eat. You’ll end up tying this fly on very often because once you get that rush of adrenaline watching Redfish and Trout blow it up out of the water, you'll be addicted. 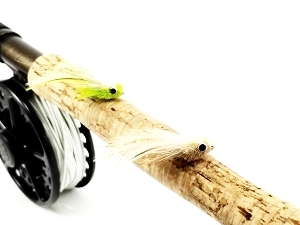 There are many variants of topwater flies, the classic Gurgler is just one example. Other examples include a modified Diver variant and the Popcorn Shrimp (pictured above) . All of these flies are absolutely deadly for Redfish and big Trout up on the flats. The Deceiver is another famous pattern known by many fly fishermen. The original was white and silver but the color combinations and sizes are infinite. The basic design is made with four to six saddle hackles tied near the back at the bend of the hook. This is followed up with some flashing and then some buck tail tied towards the front of the hook on all sides that extends just beyond the hook bend. The result is a fly that is sleek and has little air-resistance during the back cast, but in the water it swims well with a blooming action. Generally, the Deceiver fits into a open-water category as these flies are rather large compared to others. Offshore, in the surf, or next to deep channels are the ideal locations to use this fly. Fished in the Gulf Coast region, you can’t go wrong with a chartreuse and white color that has a large eye. When you’re seeing lots of Redfish up on the flats, tie this fly on and let the good times roll. They simply cannot resist the flicker and flutter as it moves through the water. The flashing and the low frequency vibration sounds it emits when being stripped excels in murkier waters. Take a look at the Sight Cast Spoon, it comes after years of research and field testing. From the shape of the spoon, to the angle of the hook, to the amount of flash on the back end; it all factors in to how the spoon sinks, wobbles, and flutters in the water. Strip this fly slow and with short pauses to allow it time to shimmer down into the water column. This pattern has many variations, but the concept remains the same. An oversized head with a long tail made of saddle hackles. The key to this fly’s success is its slow sinking rate combined with the fluid pulsing motion of the hackles on the tail. It lands lightly, hangs in the water column, and when tied with a weed guard, it is the perfect fly to fish over grassy structures in shallow water. A good deviation of this pattern that works well from Texas to Florida is the Brown-Noser fly. This has all the characteristics of the Seaducer yet adds more of a shrimp look. It’s perfect to use right up against a grassy shoreline where shrimp are plentiful. This fly was designed for Bonefish in the Florida Keys, but with some slight modifications it is perfect for Redfish and Trout here in the Gulf Coast inshore waters. It has a deer hair head that’s designed to push water and has a perfect baitfish profile that fish find hard to resist. Earth-tone colors seem to work best, a sandy brown head paired with a striped light beige body that resembles the pattern of a shrimp. This fly has a slow sink rate and suspends just below the surface of the water making this a great choice when sight fishing on the shallow flats. 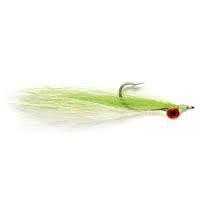 No top ten list can be without the most used and prolific fly in the world, the classic Clouser Minnow pattern. The productive color combinations are plenty, but the pattern always remains the same, a dark back with a light belly. Chartreuse and white is a well-liked option. The hook sizes and eye weight can greatly vary and give you the flexibility to fish any depth of water. For example, this fly can be tied with the standard lead dumbbell eye that will make the fly sink fast and will give you a jig action. If you’re fishing in one foot of water, you can opt for a fly tied with bead-chain eyes. These eyes are much lighter and will give you a slower sink rate. The Clouser closely resembles a glass minnow, one of the most plentiful bait fishes seen in back lakes and coves. If you find schools of glass minnows, tie on a Clouser and you’ll find the fish. Crab flies are deadly for targeting Redfish and Sheepshead in the Gulf Coast region. Most are designed to have the perfect amount of weight to slowly flutter down to the bottom and not rapidly sink into the weeds where fish can’t see it. Featuring a textured shell body and bright orange claw tips, they closely resemble a juvenile blue crab. If you cast this in front of a Redfish, allow it to slowly flutter down, and then give it very short small strips, you’ll be hooked up in no time. Crab flies come in two different styles and can be fished two different ways. The straight style, like the Straight-Shooter Crab pictured, has the hook shank positioned perpendicular to the crab body. This allows the crab to stand upright in a defensive posture with claws dancing in the current when resting on the bottom. Fish this fly slow and allow it to sink, then with very small, crawling strips you will mimic the movement of a defensive crab. Next there is the side style like the Sidewinder Crab, this pattern has the hook shank parallel with the crab body. This allows the crab to "swim" while being stripped. Retrieve this fly with steady, slow strips and it will mimic the movement of a fleeing crab. Both styles are highly effective when fished properly under the right conditions. The Merkin Crab is widely considered the most effective Permit fly ever conceived. Traditionally it's tied with two splayed hackles in the rear that act as claws, paired up with a wide profile body made of EP fibers intertwined with silicone legs that is shaped to match the natural profile of a crab, and topped off with some lead eyes to get it down to the bottom quick. 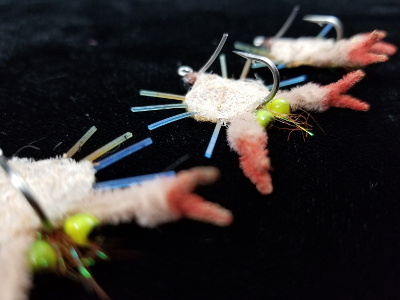 Building off this recipe and making a few modifications to resemble a juvenile blue crab, this pattern becomes a must-have for targeting Sheepshead and Redfish along the Gulf Coast. The Baffin Blue Crab fly pictured is just one example of how you can modify this pattern to fit your target species. Much like all other crab flies, it should be able to perform crawling along the bottom and the legs and claws should flutter with bite-enticing movement. Most of the flies featured in this article are available for sale in the saltwater fly shop. Attention to detail and making high quality flies that represent the people who live and breathe the back lakes and shallow flats is our main focus. Years of experience and field-testing have led to this collection of flies that is perfectly suitable to the Gulf Coast area.